Wheatwine? What the hell is that? You don’t see too many wheatwines on your package store shelves. BeerAdvocate only has 10 wheatwines listed that have been rated by more than 9 people (I generally use 10 ratings as my magic cut-off number when talking about a grade on BA). It’s an under-brewed, under-appreciated style … and that’s a shame. Wheatwines, as the name implies, are barleywines produced with a large proportion of wheat malt (sometimes half or even two-thirds of the malt comes from wheat). It’s a strong ale, which means high gravity and ABV, but the preponderance of wheat gives the beer a very different mouthfeel than barleywines (softer, lighter, and fluffier). 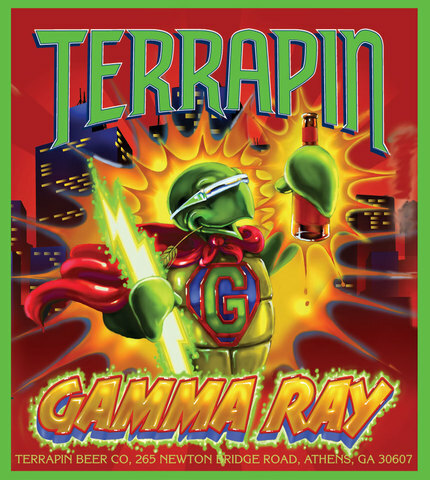 The Gamma Ray is the Terrapin Brewing Company’s entry into the world of wheatwine. It began its life as part of the Side Project series, but was so popular that it quickly worked its way onto the seasonal Monster Tour series. The brew is made with “an obscene amount of locally grown Tupelo and Sourwood Honeys from Savannah Bee Co.” That quote comes from the Terp website…I wasn’t sure how to interpret “obscene” until I drank one. Then I figured it out. The Gamma Ray pours with a hazy, almost incandescent honey gold color. The head is a frothy cream-color but dissolves rapidly and leaves broken, slick lacing. The nose has a white wine bite, slightly fruity yeast aromas, a touch of floral hops, and lots of sweetness from the pale malts and honey. Although the honey isn’t overwhelming in the nose, it becomes a dominant force during the initial taste. Candy sugar sweetness is the first flavor to hit your tongue…and while it lingers, it does make room for some nice, subtle fruit flavors (mostly crisp apples). The hop profile (40 IBUs, surprisingly) is noticeable, but can’t compete with the honey. I was very impressed with how little alcohol came through on the finish. At 11% ABV, I was expecting a fairly noticeable burn, but it was extremely well-incorporated. The mouthfeel is full-bodied, but soft like a wheatwine should be. For an 11% beer, the Gamma Ray is actually quite drinkable. But the sweetness does get a little cloying on the palate. I could see drinking a couple before moving on to a hoppier brew to counter-act that honey flavor. Still, an impressive version of a challenging style that I for one would like to see more of. 3 Hops for the Gamma Ray. Posted in Tasting Notes.Tagged Gamma Ray, Terrapin, Wheatwine. Previous Post THE MALTERCATION: TO THE EXTREME!